The American Entrepreneurship and Investment Act of 2015, H.R. 616, was introduced in the House of Representatives by Congressmen Mark Amodei (R-NV) and Jared Polis (D-CO). H.R. 616 makes the EB-5 program permanent, and introduces a number of much-needed reforms to make the program more efficient, accountable, secure, and effective for all parties involved. Some areas of reform include an improved definition of a Targeted Employment Area, a preapproval process for projects, improved EB-5 petition processing times, and measures to prevent fraud and security violations. In addition, H.R. 616 includes provisions for concurrent filing of the I-526 petition and adjustment of status application if there is a visa number available. The program also provides guidance for children who “age-out.” H.R. 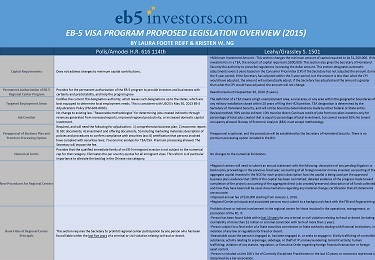 616 also proposes to eliminate derivative family members from the visa quota as well as the per country quota for EB-5 immigrant visas. These reforms aim to alleviate the backlog for Chinese-born investors and provide that the 10,000 visas actually go to the investors themselves.